Nelson’s Franchise (M) Sdn Bhd is one of Malaysia’s success stories. The company was founded in the late 1980s, some years after a toy store owner, Nelson Kwok (now Datuk Seri), made the seemingly innocuous decision to sell corn on the cob at his outlets. Soon enough, it was all people wanted from him. So, the toy store owner went into the snack food business instead. But Kwok made a simple but masterful tweak to the concept. Instead of corn on the cob, he decided to have it packed, freshly steamed and buttered, in a little cup. With that decision, he turned sweetcorn into a popular snack like popcorn and potato crisps. Today, Nelson’s is stable, well managed and more popular than ever. The Malaysian snack food franchise enjoys not only an extensive international presence in Southeast Asia but also in the Middle East. It has more than 80 locations nationwide and nearly 1,000 outlets across 16 countries. Nelson’s has significantly expanded its product range, from its pioneering “corn in a cup” to healthy freeze-dried corn snacks, corn-flavoured ice cream and even corn milk. Even more impressive is the fact that despite its global presence and frankly ubiquitous availability of sweetcorn worldwide, the company has steadfastly kept its production lines and farmlands in Malaysia, creating thousands of jobs over the years. 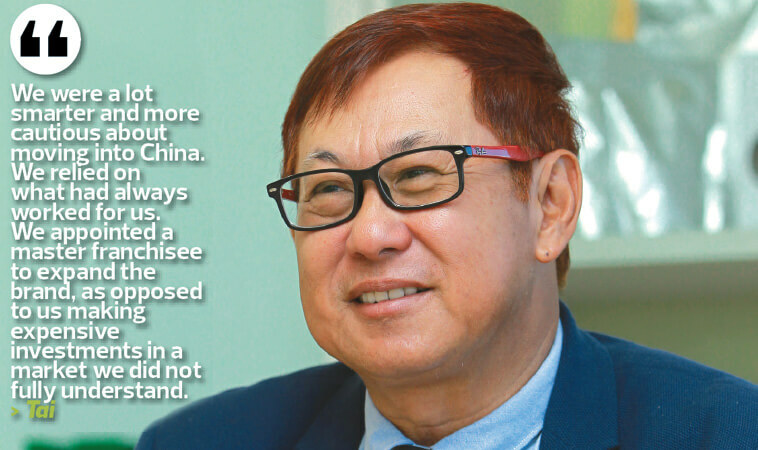 Enterprise interviewed second-in-command general manager Datuk Eric Tai, the man behind Nelson’s push into the global markets. An accountant by training, he invested in the company 12 years ago and has not looked back since. So, how does a company go from corn on the cob to being a global master franchisor? According to Tai, it is by taking a very measured and conservative approach to doing business overseas. But first and foremost is getting the expansion model right. “We adopted a master franchising model, simply because it puts no pressure on us as the brand owner to raise capital to penetrate foreign markets. When international applicants approach us, we offer them a master franchise agreement, assuming of course that they fulfil certain criteria,” says Tai. He adds that local partners in foreign markets tend to have better access to capital and on-the-ground business networks, in addition to key insights into local regulations and customs. And understanding local customs can make all the difference between success and failure, he points out. This decision has paid off as Saudi Arabia remains one of the company’s most stable international markets. But choosing a master franchising model is a risky proposition, mainly because brand owners cannot exert direct control over international franchisees. So, while good partners beget good business, bad partners could bring the entire brand to its knees. One key risk factor in the master franchising model is the master franchisee failing to manage its finances. This leads to a host of problems, especially not being able to afford to buy raw ingredients from the brand owner. A short-term fix would be for the brand owner to extend a line of credit to the master franchisee, in the hope that the latter gets itself back into the black without an interruption in supply. But throwing good money after bad catches up, and this was something Tai was determined to avoid. Ever the astute numbers man, he wove risk management features into the master franchisee contract. “Structuring the master franchisee agreement is crucial. So, even before the franchisee can take delivery of the goods, it has to pay a 50% deposit upfront. Then, just as the orders are about to ship out, it pays the arrears. Thus, the risk of bad orders is quite minimal,” says Tai. The strategy appears to have worked well. “Out of all our international master franchisees, only two needed us to provide them with a credit line. Everyone else kept their expenses in check,” he says. The beauty of setting strict terms in the master franchisee agreement is that only serious companies apply to carry the brand in their respective countries. But this is not to say Nelson’s has not chosen poorly before. “We gave the franchise in the Philippines to a friend. But the business there was run very poorly,” says Tai. If you are not planning to have a direct physical presence in an international market, your local partner becomes your eyes and ears on the ground. They carry your brand reputation in their market while you lose some control of it. As a result, selecting the master franchisee, and even the market, is key. To this end, Nelson’s developed a very comprehensive information-gathering framework in the form of market survey documentation. “Potential master franchisees first have to complete our comprehensive market survey document,” says Tai. Before he even sets foot in an international market, he needs to know the average rental prices and salaries of workers, labour laws and, of course, the presence of competitors and the price points at which they sell. “We also want to know all about the potential master franchisees themselves — who the owners are, what the organisational structure of the company looks like, its paid-up capital, how much money it is willing to invest in building the brand and over how long a period, the quality of its facilities as well as the strength of its business networks,” he says. Having received all this information, Tai then gets to work developing a comprehensive cash-flow projection for the master franchisee. “Based on the information, I will determine how much capital is required if they expect to open a certain number of outlets over a certain period of time. Then, we can start looking at projected profits and losses over that period of time. Finally, we come up with a projected payback period — basically, the point at which the master franchisee becomes profitable,” he says. Assuming Tai is agreeable with the market conditions and the applicant agrees to be contractually bound to a certain number of Nelson’s product shipments per month, a standard master franchisee contract is drawn up and signed by both parties. Like countless other businesses, Tai and managing director Kwok were seduced by the multimillion-dollar allure of the burgeoning Chinese market. Once the world’s production line, China’s newly affluent middle class has turned the country into one of the world’s most important consumer markets. But Nelson’s first attempt at penetrating the Chinese market was an outright and expensive failure. “Years ago, we tried to venture into China by ourselves. We committed a lot of capital and even set up an office there in the hope of getting a franchise off the ground,” says Tai. “But one thing we never expected was that local regulations and requirements changed all the time. It was difficult for us to manage the business effectively. It came to the point where we were suffering losses nearly every month. “Eventually, we could no longer bear the losses and had to bite the bullet. We closed the office and exited China. We then took about three years to recover from the experience, at which point a China-based company approached us to take our brand there once more. So, what did Tai do to keep things on an even keel? “I made sure the master franchisee hired someone with an accounting background, who spoke good English and with whom I could work well. I got this person to draw up a monthly report card on the finances and cash flow, and I would receive this report card at the end of each month,” says Tai.